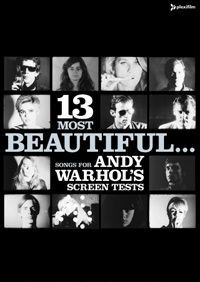 Plexifilm are taking pre-orders for the DVD release of "13 Most Beautiful...Songs for Andy Warhol's Screen Tests" with music by Dean & Britta. There are two versions - a very limited deluxe edition for $250 and a standard DVD at $30. The limited edition DVD is presented in a deluxe gatefold LP-style package with an exclusive poster and booklet. In addition, one frame from each of the 13 Screen Tests will be hand-printed as an 8" x 10" archival gelatin-silver photograph in an edition of 100 on Ilford Multigrade fiber paper. One of these individual prints is included in each package. a behind-the-scenes documentary on the live production of the 13 Most Beautiful... Songs for Andy Warhol's Screen Tests performances, and a video interview with Dean & Britta about Andy Warhol, the music and the project. The booklet includes brief biographies of the Screen Test subjects, liner notes from the Warhol Museum's Thomas Sokolowski, Geralyn Huxley, and Ben Harrison and notes on the music from Dean Wareham. 13 Most Beautiful...Songs for Andy Warhol's Screen Tests gets its first presentations (with live accompaniment from Dean & Britta) this weekend at the Byham Theatre in Pittsburgh - tickets are available from the Pittsburgh International Festival of Firsts website.